Cannabis beer, weed beer, pot beer… whatever you want to call it. But what is it? So, you wanna know about drinking weed? Now that marijuana is legal in Canada, cannabis companies are looking into different ways to get a smoke-free high. Starting with cannabis beer. Is Cannabis beer actually beer? Well, that depends on your definition of a beer. There are two types of weed beers: Cannabis Beer and Cannabis-Infused Beer. Cannabis beer is a non-alcoholic beer, brewed with the marijuana plant. It’s gluten-free and low-calorie. How is Cannabis Beer Made? Cannabis beer is brewed with crushed stocks, stem and roots of the marijuana plant itself as opposed to being infused with Cannabis oils. 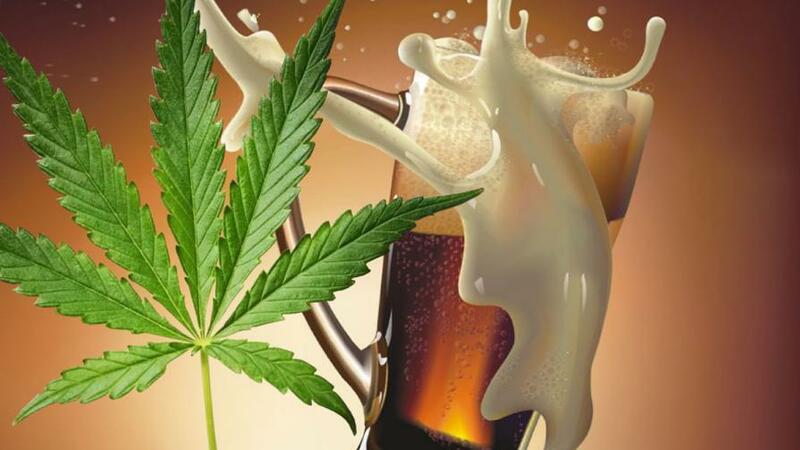 The marijuana replaces the use of barley in the brewing of Cannabis beer. Companies such as Province Brands are preparing to hit the market with the first weed beer available in Canada as edibles are expected to become legal in 2019. Cannabis-Infused Beer is beer infused with Cannabidiol (CBD) or Tetrahydrocannabinol (THC). Cannabis-Infused beer is also non-alcoholic and often contains little to no calories. Currently, CBD-infused weed beer is available in select states where marijuana is legal, however, Canada will not expect to see cannabis-infused beverages hit the shelves until 2019. How does a Brewer Make Cannabis-Infused Beer? Cannabis-Infused beer is brewed with barley, much like traditional beer, and infused with Cannabis oil or THC & CBD oils. Does Cannabis Beer actually get you high? What does Cannabis Beer taste like? David Nuttall is an instructor at the Alberta Beer Festivals’ Beer School. He has worked in almost all aspects of the liquor industry. He is the current Judging Co-ordinator for Calgary International Beerfest and completed the Beer Judge Certification Program in 2012. He is passionate about beer and beer culture. This article is the first of a fascinating series on different beer styles. Original Gravity, Specific Gravity, Final Gravity find out what it all means as we continue on our beer variety journey. In this series, we are looking at what characterises the hundreds of styles of beers that are available. So far we have looked at how gravities and alcohol by volume (ABV.) are calculated, and how colour is measured and named. In this article, we will examine bitterness, the counterbalance to the sweetness from the malt, which is derived mostly from the hops. In this series, we are exploring what characterizes the hundreds of styles of beers that are available. While yeast is the most important determinant of beer style, two of the other main ingredients (hops and malt), and how the beer is brewed, among other things, also play a part. It is these factors that create the inherent qualities of the beer, which formulates each category or style. Part Two looked at how gravities and alcohol by volume (ABV.) are calculated. In Part Three we will explore colour; how it is measured, and how the different colours are assigned.